Lead-acid battery is the important component that restricts and affects the normal use of military facilities and weapon systems such as military vehicles, ships, radar stations and communication stations. However, the batteries may be failure and scrapped in advanced due to the irreversibility of sulphate. Therefore, our company devote ourself to research and develop a new high-tech product of UPS Battery Saver for Batter Repair named as 12V UPS Charger Restorer Tester All-in-One in our army. The capacity of the batteries can be effectively recovered, put into use again and greatly reduce the military expenditure. With the successful development and popularization of this product--Battery Saver, the effective maintenance of lead-acid batteries can not only save a lot of military expenditures on battery purchasing, but also ensure the good performance of the batteries of military motor vehicles and weapon systems and enhance the mobile combat capability and rapid reaction capability of our army, so as to provide powerful help for the equipment modernization of our army. When the 2 electrodes of the recovery system are connected to the cathode and anode of the battery, the special pulse wave produced by the recovery system of UPS Battery Saver will act on the two electrodes of the battery continuously and change the movement state of e and H+. Therefore, the lead sulfate crystals which can not be dissociated under the normal charge electric field are continuously dissociated into Pb2+ and SO42-, that is, the PbS04 crystals are decomposed under the action of pulse wave according to the charging law and return to the solution after dissolution. After the irreversible sulfate on the electrode is completely removed, the battery plate is activated, the internal resistance is reduced, the capacity is recovered or partially recovered, and the charging efficiency is improved. 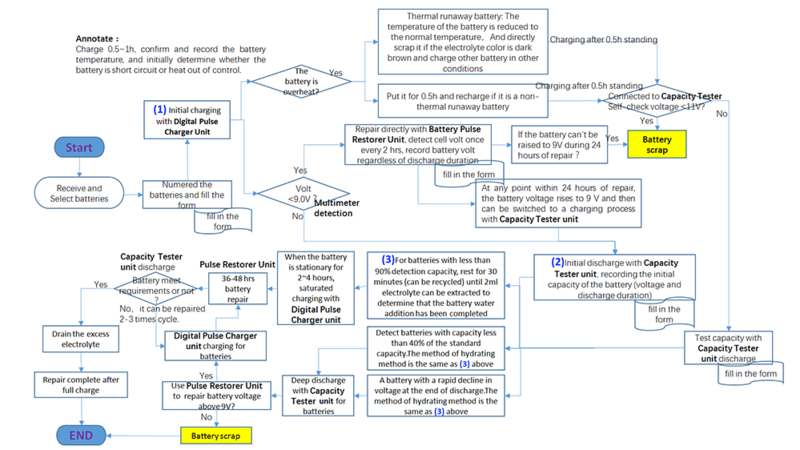 Therefore, the recover process of battery capacity is an electrochemical process. This 3-in-1 integrated Recovery system is composed of 3 parts and a professional standard restore process: 1) 12V UPS Battery Saver Unit(36~300Ah); 2) 12V UPS Battery Smart Charger Unit; 3) 12V UPS Battery Tester Unit. 4 Pulse charge channels , each channel have three ranges :10A, 15A, 20A. 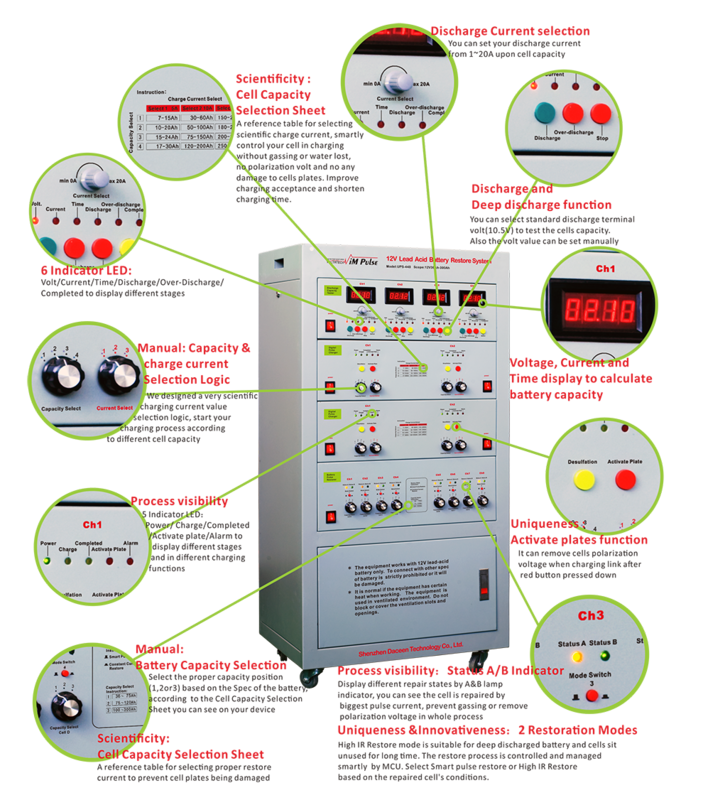 Select the right charging current according to the capacity and conditions of batteries , the system have a special IC to control automatically recharging without on duty. 8 Pulse battery repair channels for different capacity of batteries: 36Ah~75Ah, 75Ah~120Ah, 100Ah~300Ah. Selecting the suitable range can be ensure better protection of battery plate in UPS battery pulse desulfator working, and extend battery life up to doubled or more. Application to Industry Range: Sightseeing car, Golf Cart, Wind and Solar energy, UPS and Back up power system, Telecom base site battery, Tricycle, Boat, Train, State Grid and Military battery for Sudden affair, etc. Battery Type Range: All of Lead Acid Battery(AGM, GEL, VRLA, MF, Flooded, Dry, Traction, Deep cycle and Stationary), and widely range used in 12V (20~300Ah) cells. Before repairing, please charge the battery fully, check it for the need of water adding or check the positive plate for softening and falling off, etc. Our patented Composite resonant pulse technology is the best in the world, through intelligent pulse being resonant with sulfated crystals, restore battery vitality which results in increased electrolyte gravity, reduced inner resistance and increased battery capacity, and extend battery service lifespan without any damage to the battery physical structure and battery plates. Joint appraisal by experts group - From Professional field of Electrochemistry, Physics Power Supply, Environmental Sciences, Electronic Engineering, etc. We have standard desulfation repair work-flow chart (English version). Our product manual has specifications to describe the operation of the equipment in detail; The battery desulfation repair process is fully automatic, only after confirming the repair mode according to the battery capacity, select the desulfation current when it is accessed to the battery, and then the device is intelligent and repair process is smart. Generally repair process is 24-48 hours, and new batteries maintained is about 12 hours. 3) Number of batteries repaired ? One single repair machine: 4 pcs 12V (36-300Ah) batteries, and integrated UPS-448 is 8 pcs 12V (36-300Ah) batteries. 4) How long will it take after repair? This is not an absolute standard. According to the user's battery application habits, the storage environment temperature and humidity of the battery, and whether there is daily maintenance, it can generally be more than 1 year. 5) How bad batteries can be repaired? First, a new battery, which has not been used for a long time, has been stored in warehouse or on shelf for more than 2 years. The voltage is close to 0 volt which can not be charged or discharged. We can recover it as the new battery (no company in the world can do it, only our technology can achieve it). Secondly, for UPS backup batteries, almost more than 90% of the capacity reduction is caused by battery sulfation. These batteries sulfation can be removed by our repair equipment, and its capacity recovered to more than 80% or even more than 90% as new battery capacity. Thirdly, for new lead-acid batteries, if they are maintained regularly 1-2 times a year once put into used, the lifespan of the batteries can be close to its design life. That is to say, the life of the batteries can be prolonged by 1-3 times after applied our technology. Looking for ideal UPS Battery Saver Manufacturer & supplier ? We have a wide selection at great prices to help you get creative. All the UPS Battery Pulse Desulfator and Optimizer are quality guaranteed. We are China Origin Factory of UPS Battery Smart Charger and Tester. If you have any question, please feel free to contact us.